Kingdom Come was one of the best comics of the '90s, and is one of the best DC comics ever. It was an indictment of the "Image"-ification of comics, with the staid old DC heroes pushing back against the excesses of their violent, flashy successors - successors led (spiritually, if not organizationally) by Magog. Lance Corporal David Reid already had the distinction of being a U.S. Marine and the great-grandson of Franklin D. Roosevelt before he touched the stone fragment that gave him plasma energy powers. While investigating the resurgence of the old God Gog, he was tragically killed by a military attack. Resurrected by Gog, given new powers and the name Magog, he became a devoted disciple. However, Magog eventually saw the evil in his master and heroically helped to destroy it. That bio describes the modern, "New Earth" version of Magog, who fought alongside the JSA until he was killed - which is why the back of the packaging lists his first appearance as Justice Society of America #18 from March, 2008, rather than correctly identifying Kingdom Come #1, from 1996. The Kingdom Come/Earth-22 version never really had an official origin, though he was at least once hinted to be the future son of Superman and Wonder Woman, transported back in time through the power of Gog. 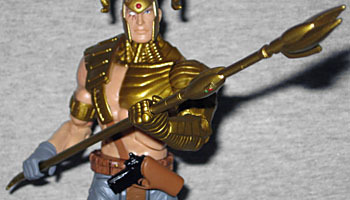 Magog was designed to be everything people hated about '90s comic costumes. Which means he's basically Cable with almost zero changes. 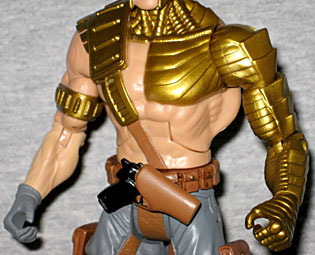 His left arm, upper torso and neck are layered gold metal, and he's wearing a completely useless band around his right bicep. He's got a silly shoulder pad that connects to his belt - a belt, by the waym that has a dozen tiny pouches all the way around it. There's a strap running between his legs, and two straps that run from that to the straps around his thighs. And on those straps? More pouches. He has padding on the front of his boots, and under it all he appears to be wearing completely normal pants that are color-coordinated with his single right glove. All of that mess is a new sculpt (except maybe the right shoulder), and it looks top-notch. 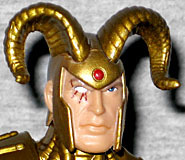 Even Magog's face is inspired by Cable: he's got scarring over his right eye, though rather than going with a simple X, Alex Ross intended Magog's scars to look like the Eye of Horus - part of a conscious effort to give the character a slight Egyptian/Biblical feel. The horns on his head cast him as the Golden Calf, the false idol the people turned to after Moses left them. The shape of the headgear is another Liefeld nod, this one much subtler and easier to overlook: it's modeled after Shatterstar's facepad. 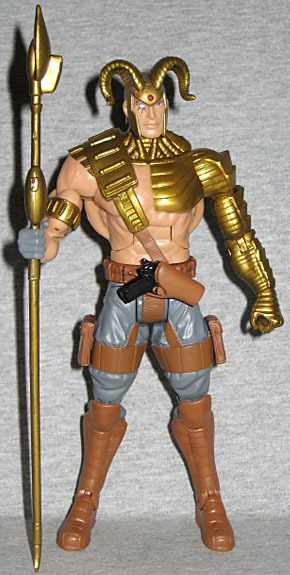 DC Direct made a Magog figure years ago, but that entire series was terribly under-articulated. Magog moves like every other DCU Classic figure, so this is a big step up. He has a gun in his belt, but it's sadly not removable; his only true accessory is his power staff. It's 7½" tall, and has a bit of an Egyptian style to it, as well. Techno-Egyptian. Ancient techno-Egyptian. He's poseable enough that he can wield the staff with both hands, if you so choose. Magog comes with the right leg of the Series 19 BAF, S.T.R.I.P.E. 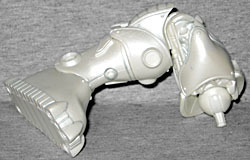 The leg is completely colorless, and reaches as high as the figure's chin. Most of the sculpt has been seen before, but there's enough new work to keep it from looking like a retread. Including the bottom of the foot, which has been given a new tread. I wasn't very excited when Magog was announced for Series 19, but the figure turned out really well. For a character meant to impugn '90s comicbook fashion, he really turned out decent. You can almost imagine Kirby drawing this guy, you know? Heck, he's good enough to almost make me wish I'd gotten the DCUC4 Captain Atom variant when it was pegwarming everywhere.